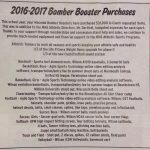 The mission of the Bomber Booster Club is to encourage the development and maintenance of a quality athletic program at Macomb High School. It also strives to stimulate community interest and pride in the student-athletes and teams. The Macomb Bomber Boosters were formed on 4/8/1974. 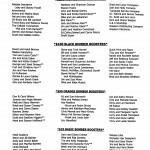 Facebook: Macomb Bomber Boosters – Like Us! Macomb High School is in Macomb, IL and is the high school of School District 185. More information can be found at the Macomb High School Athletics Webpage. Sports team schedules are housed at il.8to18.com/macomb. You may also use the Team Schedules page at the top. Website: www.bombersports.org This was moved to a WordPress format on 5/27/2015. The site is hosted at 1and1.com. Webmaster: Jim Olsen. Please report errors, suggestions, and corrections to jr-olsen “at” wiu.edu. [The ‘comment’ function of the website has been disabled, due to the fact that we do not have anyone that can regularly monitor the comments.] Website visitors who have comments should contact Jim Olsen or a board member or committee chair.